You are viewing all posts published for the month of June, 2018. If you still can't find what you are looking for, try searching using the search form. Featuring Matt Anderson and Ben De Bono Ben walks us through a fascinating conversation about the innate role of story in the human make-up. 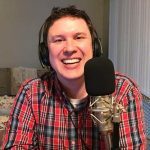 Featuring Matt Anderson and Ben De Bono Matt recently bought a new home, and the listeners sent in tons of advice to help Matt as a new homeowner.